Yes. Yes, I did. Right there in the top left corner. See!? I’m quite sad, and yet, filled with a strange sensation of (hmm, what could this be?) satisfaction. It’s the first time I’ve ever hit the pan with a makeup product. And this is just a testimony of just how amazing The Body Shop shimmer waves is (are?). 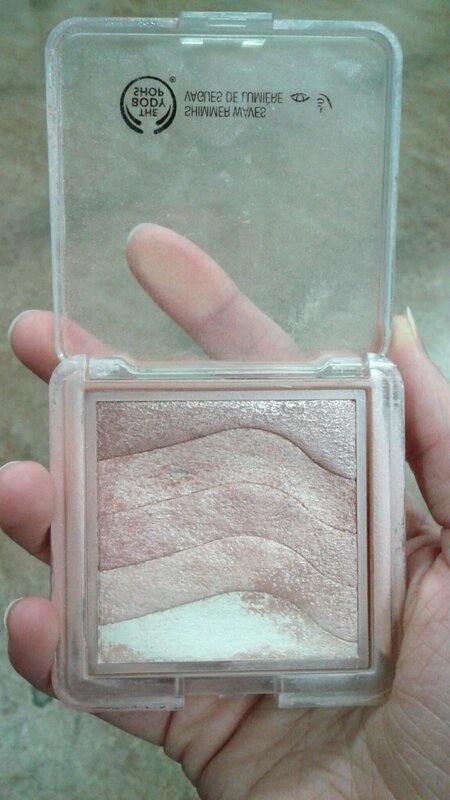 I use it nearly every day, and the blush/highlighter combo is the best makeup trick I learned last year (and possibly in my life)! The time to embark on a quest for a new highlighter approaches like a knight on a galloping steed! This looks like a very nice product… Might have to check it out :). I really like it 🙂 It’s like a more affordable version of Bobbi Brown’s Shimmer Brick (in my head, anyway ha ha).